For 700 years Scoz am Rhein had it's magnificent Castle, the Burg Scozes. The very name Scôz means Fortress, and it was the oldest building in the city. Though demolished in the 1800's, it still has a place in History. Constructions of the castle started under the reign of Oleg the Noseless, in the late 1100's. 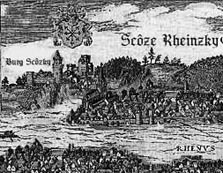 After the battle of Steiff in 1214, Stanislaw I ordered a city to be founded around the fortress, the true birth of Scôz am Rhein. The first fortification was built of wood, but was gradually replaced by stone structures through the years. From 1310 the Burg served as Royal Palace for the Grand Dukes of Scôz. Alterations and enlargements were constantly made, and all Grand Dukes left their mark on the Burg. Most famous were doubtlessly the lavish Winter Garderns commissioned by Grand Duke Sevenir and designed by the dutch architect Nelz van Messer. The Burg was partly transformed to a Baroque Palace by Grand Duke Ludwig, and miraculously escaped unharmed by the Great Fire in 1734. In the late 1700's, the Royal Family felt the old Burg was too small for their needs. Grand Duke Fritz II had an entirely new palace being built outside the city, the magnificent Schloss Weizdgerbak, and in 1797 the Royal Family deserted the Burg. Between 1799 and 1837 the old castle served as a Prison, and for a short while it also housed the city's asylum. But after a disasterous fire in 1837 the old buildings were abandoned and left to decay. The once so proud Burg was torn down in 1893.Parts of the Cellars and catacombs were spared though. The new buildings were designed by Otto van Mottke, and included a luxurious hotel, the Grosz Scôz. Most of these new buildings were destroyed by the Allied bombings of WW2, along most of the City Centre. After the war, new buildings were erected on the site. Most impressive was the Szragdny Doun, designed by the german-russian architect Vladimir Hewenov. The building was designed to serve as an international Centre for Art and Culture. But in reality it came to serve as a Fish factory before it was condemmed in 1985. In 1992 a Burg Museum was opened, incorporating both the old Wine Cellars and parts of the Hewenov building. Remains of the old castle foundations were found in the process. In this new Museum you can experience images and models of the old castle, still so foundly remembered by the Scozers.